However stylised, folk dance inevitably follows a basic walking pattern. The foot may flex, stomp or hover but, as choreographer Russell Dumas used to say, dancing is so often a matter of left-right, left-right. 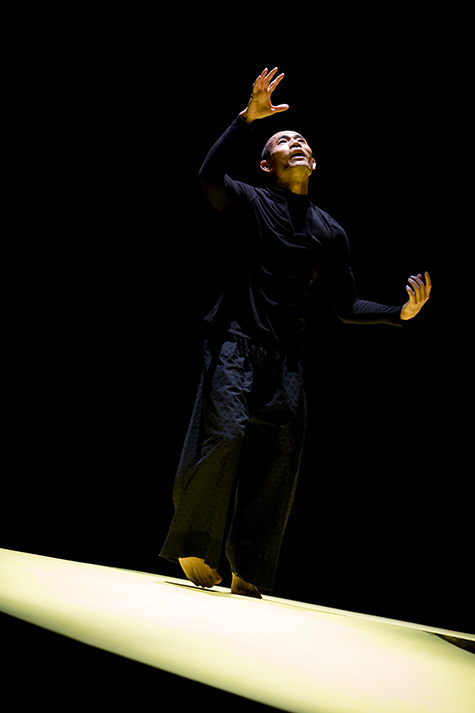 Pichet Klunchun’s Dancing with Death (see video) is no exception. Large figures move through the audience to rhythmic, melodic Thai music. They wear masks and sport garish, psychedelic outfits woven from bright nylon threads. But they walk just like us…bipedally. The Gods have come to Earth. They are playful and plentiful. Swaying from left to right, they tread lightly on the land of men and women. The music gives way to high pitched sound, an amplified tinnitus that ruptures the folksiness. The figures retreat. We enter an abstract space and time, able now to focus on the solitary shape that dominates the space. A twisted ellipse rises and falls, creating a perpetual, deformed, oval pathway for the dancers who enter one by one and slowly walk in a daisy chain of continuous action. The work becomes durational, quietly existential. While everyone treads the same path (of existence), there is room for individual expression: a woman skips joyfully, a man lunges, another arches backwards. There is thus a play between the personal and the impersonal. When the dancers come together they exert a palpable force, the force of common humanity. After a while, a handful of the dancers swoops along the sloped pathway, slowly turning at its peak to swoop down again. This is where the technical challenges of the piece become apparent. These dancers are classically trained. Their daily practice is conducted on flat ground, whereas this set design calls for the ability to manage its changing gradient. The dancers struggle with this: we see the tension in their faces, heads and necks and in certain mannerisms—defensive habits. Pichet Klunchun displays none of this. His body is at one with the rise and fall of the oval pathway. There is no mannerism, nothing personal, just consummate skill. His gestures—the continuous rolling of hands and arms—offer an experience of pure duration. In a work that addresses life and death, this is key. We the audience need to feel the spaciousness of time, the universality of matter. Klunchun is at once godlike in his dancing yet human in the need to compose himself, to achieve what he wants to achieve. He is mortal like us. There is another way of looking at the dancers’ difficulties with this piece, beyond the criticism that the work is not yet settled in highly skilled bodies, and that is that these dancers are in the midst of life, encountering that which lies beyond the known. If the work is not a theatrical representation of life in the face of death, but rather a lived enunciation of it, then perhaps we can accept their struggle. They are like us and we are like them. Dancing with Death is situated in the spiritual everyday. It boasts liminal figures: gods and the godlike. The work ends with the return of the folkloric gods. Yes we die but that’s not all. Existence is fringed with the incorporeal, a beyond that appears in our peripheral vision. This is something we may feel but cannot know for sure. 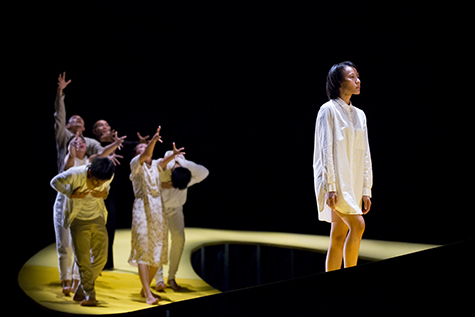 Dancing with Death was commissioned by Esplanade—Theatres on the Bay (Singapore) and co-produced by Performing Arts Meeting in Yokohama 2016 Executive Committee, Arts Centre Melbourne and Adelaide Festival Centre OzAsia Festival.